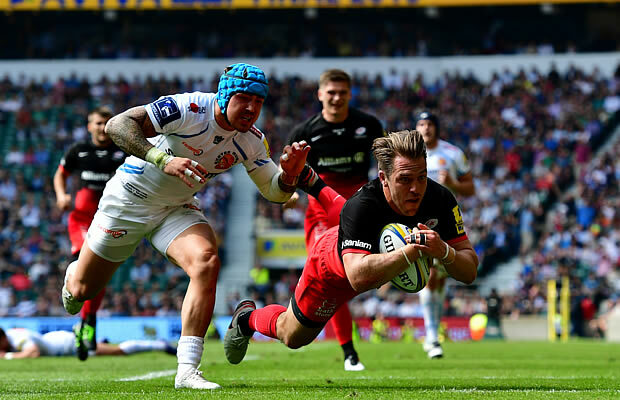 Saracens held off a second half comeback from Exeter Chiefs to win the Aviva Premiership final 28-20 at Twickenham on Saturday. Saracens won the title last year and this season have completed a rare double of being crowned European Champions as well as Premiership champions. Two weeks ago, Sarries beat France’s Racing 92 21-9 in Lyon to win the European Champions Cup. They are the first English team to earn the double since Wasps achieved the feat in 2004. 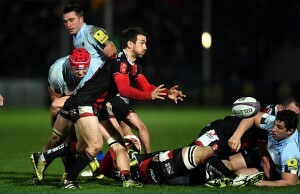 Saracens outscored Exeter by three tries to two in the match and Alex Goode was named man of the match. Sarries looked home and dry when leading 23-6 at half-time but a stirring Exeter fightback in the second period saw them score 17 unanswered points before Alex Goode’s late try sealed the Londoners’ victory. Two tries in three minutes from Duncan Taylor and Chris Wyles gave the defending champions a huge buffer but they were rattled by the Exeter response in the second-half, an illogical comeback eventually killed off by Alex Goode’s try four minutes from time. Exeter were a shadow of themselves in the first 40 minutes but they brought both the game and a bumper 76,109 crowd to life with the hunger they showed after the break, tries from Alec Hepburn and Jack Nowell turning what at one point had been a 20-point margin into just three. Saracens though held their nerve, as they have so often this season, becoming the fifth club ever to pull off a league and European Cup double. To pull that off requires incredible reserves of energy and Saracens were forced to scrape the bottom of those until Goode’s score. Other sides might have wilted under the sun at Twickenham. Not them though. Much is rightly expected of Henry Slade but he had a minute to forget with a drop under the high ball and loose kick out on the full when counter-attacking in the opening period that were symbolic of his side’s cagey start. Early on Exeter’s attack wouldn’t click and through their control of the territory Saracens also manipulated the scoreboard. The European champions’ ability to strangle sides out of games late on has become their trademark, but they were making that happen earlier than planned. Two penalties from Farrell handed Saracens a 6-0 advantage, Steenson responding to put Exeter on the board, but as the first-half ticked away Saracens grew in stature. Farrell’s third penalty restored that six-point margin and it was the England talisman’s boot which then created the game’s first try. Following on from a trademark Schalk Brits break up the middle, Saracens recycled left before Farrell threaded a delightful low kick across for the waiting Taylor to stroll over after the Chiefs defence had rushed up. If that try winded Exeter then after the next one they were on the canvas. No less than three minutes later Wyles was stepping and sprinting his way over, somehow slipping out of an Exeter tackle before pinning his ears back for the corner. The 23-3 margin, following another superb strike by Farrell, was eerily similar to last year’s one-way first-half against Bath. Steenson, the Premiership’s top points scorer, reduced that gap with a second penalty, but Exeter were well behind by half-time at 23-6 and frankly looked in need of a good shake-up. And they came back out with plenty of fight. Phil Dollman and Ian Whitten took their turns to try and spark something but without anything to show for it. A rash kick to touch from Steenson when Exeter had an overlap on the near side suggested they were running out of ideas. Surely they had more to give than this after so many brilliant moments this season. 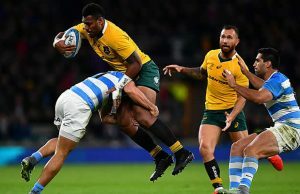 Apparently so, crashing over through a rolling maul in the far corner through replacement prop Hepburn to an almighty roar from their supporters and the neutrals inside Twickenham. Steenson’s conversion, from right out on the touchline, sailed over to cut the gap to ten points at 23-13. All that could be heard in Twickenham now was the sound of the Tomahawk Chop as the underdogs began to try and fight their way back. Fighting the clock Exeter gave everything. Rob Baxter might have been disappointed with the first-half letdown but oh his side wanted this, rallying not just themselves but the crowd as they dug deep. After keeping Saracens out at one end Jack Nowell went over in the corner following Slade’s half break and the dream was very much alive. Now the question has to be asked whether Saracens had already empited the tank, but the response was prompt – quick interplay from Marcelo Bosch and Chris Ashton freeing up Goode to go over for their third try. Charlie Hodgson, off the bench in his final appearance, couldn’t land the conversion to leave the score at 28-20 but Exeter were left with too much to do now. It was double glory for Saracens, a sensational campaign ending with both European and now Premiership trophies. Mark McCall’s side have been favourites throughout, and delivered.